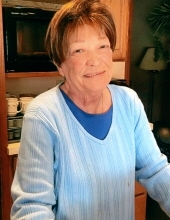 Betty Jean Burrow, a long time resident of Milford and former assistant supervisor in the Milford Village & Township offices, died on February 3, 2019 at the age of 78 after a year-and-a-half battle with lung cancer. She is survived by Paul, her beloved husband of nearly sixty years; her daughter, Kim Renko; her sons, Paul “Dave” Burrow II and Bill (Kelly) Burrow. Grandmother of Amanda Chaffee, the late Tayler Mackenzie, Drew, Alison, and great grandmother of Alexandrea and Asher. She is also survived by her brother, Robert L. “Buddy” McCain (Beverly); in-laws, Randy Burrow (Mildred), Sammy Burrow (Judy), and many nieces, nephews and dear friends. Visitation will be held at Lynch & Sons Funeral Home, 404 E. Liberty St., Milford, on Friday, February 8, from 3-8PM. A Funeral Service will be held at the First Baptist Church of Milford, 133 Detroit St., Milford, on Saturday, February 9, at 10AM, with visitation beginning at 9AM. Burial will follow at Milford Memorial Cemetery. Memorials may be made in her name to the First Baptist Church of Milford or to the American Cancer Society. For further information please phone 248-684-6645. "Email Address" would like to share the life celebration of Betty Jean Burrow. Click on the "link" to go to share a favorite memory or leave a condolence message for the family.